Day 2 Report: Usman Khawaja eased toward his first century in more than a year as Australia reached 193-2 at stumps on the second day of the fifth Ashes Test, 153 behind England's first innings total of 346. After some big hitting by England's lower order earlier Friday, Australia had an early setback before half centuries by David Warner and Khawaja helped place the team strongly in its push for a 4-0 series victory. Australia went through Friday's last session without losing another wicket with Khawaja, nearing his first Test century since November 2016, unbeaten on 91. Captain Steve Smith contributed an unbeaten 44 to the 107-run third-wicket stand. Khawaja struggled early to find any rhythm, particularly against spinners Moeen Ali and Mason Crane, but survived to raise his 50 off 107 balls just after tea with a six straight down the ground off Ali. "We know how well he's been hitting them all summer, he just hasn't got that big score to get him away," said bowler Pat Cummins, who took 4-80 in England's first innings. "His play against the spin today was really great, he used his feet really well, I think I saw a reverse sweep there at one stage so he's always evolving but he always looks like he knows his game really well." Smith scored his 6,000th Test run in his 111th innings, joining West Indies great Garfield Sobers as the second-fastest to reach the mark. Only Don Bradman reached 6,000 runs quicker, from just 68 innings. "He's obviously played very well and he's scored a lot of runs, but he's only human as well," said Crane, who bowled well in his first Test despite not yet taking a wicket. "It's awesome to be bowling against some of the best players in the world, that's why we play the game." England resumed at 233-5 and lost its last specialist batsman, Dawid Malan (62), early in the morning session to a spectacular one-handed catch by Smith at second slip off Mitchell Starc (2-80). Australia spurned easy opportunities to thwart England's rally, including two dropped catches in the space of four balls to give both Curran (39) and Moeen Ali (30) reprieves. "It's actually not a great 'seeing' ground here, said Cummins, who dropped Curran off spinner Nathan Lyon. "I know that's not a great excuse but sometimes you just don't pick them up that well, but both should have been taken." Ali's second chance was brief, however, with Cummins (4-86) having the allrounder caught behind soon after to leave England at 294-7. 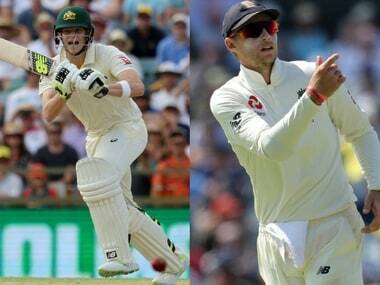 Broad and Curran, playing just his second Test, combined to guide England past 300 and kept swinging the bat in an entertaining 41-run partnership, before Curran popped a catch to Bancroft at short leg off Cummins. 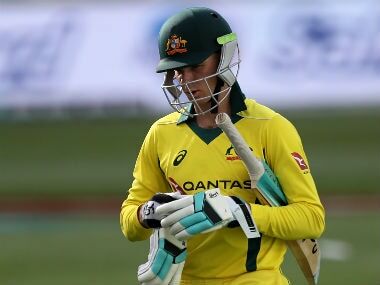 Broad made 31 off 32 balls with a boundary and two sixes before mistiming a sweep shot to be caught by Smith off Lyon (1-86). Crane was the last wicket to fall, run out in his Test debut, just minutes before the scheduled lunch interval. Australia won the first three Tests convincingly to regain the Ashes, and the fourth Test was drawn last week in Melbourne.